The countertop is granite, almost solid black--just a few flecks of white. The sink is not quite as radically purple as the colors in this shot suggest: the maker calls the color "Raspberry Puree," and that's a reasonable, if gaudy, description of it. 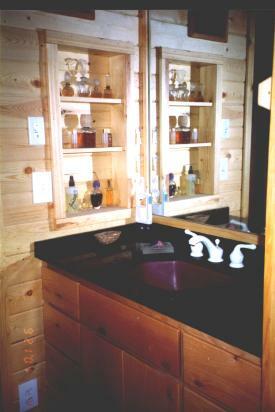 The counter is adult height, 36 inches (not the usual 30) and four feet wide; the mirror is full width. Finding most medicine-cabinet "cans" ugly, we opted for lots of deep drawers and a built-in wall box for displayable bottles. The hanging-down cable spaghetti on the back wall behind the TV has been tidied up a bit since this shot was taken. The white objects crammed here and there among the equipment (which includes both small-dish and large-dish satellite receivers) are baseballs: we are immense fans of the game, and all of the decor in that room is baseball-based (you can see, for example, the two gloves on the wall strip to the right of the TV area). 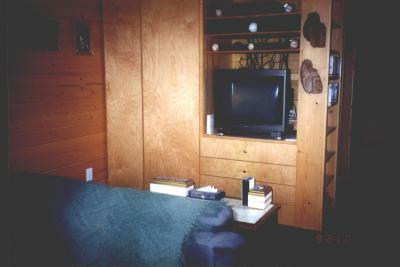 The two unequal-size panels to the left of the TV area are closets: the larger one is a modest closet for guests, while the smaller one is a broom/cleaning closet. Not visible in this shot are the huge storage areas above the closets and TV area (ten-foot ceilings, recall). The couch is actually a convertible: it becomes a queen-size bed which, we have been told, is pretty comfortable for such a thing. Well, that--for now--is the interior shots. Next, let's take a little look at the Owlcroft garden/orchard area.